• Two celebrated series of paintings by Pre-Raphaelite artist Edward Burne-Jones have been brought together for the first time in their entirety in a new exhibition at Tate Britain. The large scale works known as The Briar Rose (c1890) and the unfinished Perseus series (started in 1875) – the artist’s most famous narrative cycles – are at the centre of a new exhibition, Edward Burne-Jones: Pre-Raphaelite Visionary, which opened at the gallery yesterday. 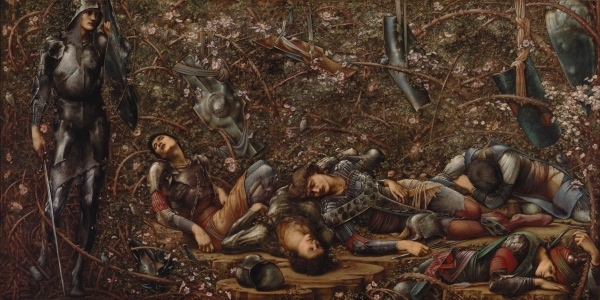 The Briar Rose features four canvasses – shown in a museum setting together for the first time – which illustrate the fairy tale of Sleeping Beauty while the Perseus cycle, commissioned by then-MP and future PM Arthur Balfour, was intended to be 10 large scale oil paintings retelling the ancient myth of Perseus but was only partly realised (the display includes four finished paintings and six full scale preparatory drawings). The other 150 works on show in this display – the first major Burne-Jones retrospective to be held in London in more than 40 years – include paintings, tapestries and stained glass panels. Among other highlights are the large scale paintings Love among the Ruins (1870-73) and The Wheel of Fortune (1883), the stained glass work, The Good Shepherd (1857-61), and altar piece The Adoration of the Magi (1861), drawings including Desiderium (1873), portraits such as those of Amy Gaskell (1893) and Lady Windsor (1893-95) and embroideries, illustrated books and large scale tapestries including The Arming and Departure of the Knights of the Round Table on the Quest for the Holy Grail (1890-1894) and the Adoration of the Magi (1894). Runs until 24th February. Admission charge applies. The exhibition is accompanied by a programme of talks and events. For more, see www.tate.org.uk. PICTURE: The Briar Wood 1874-84, oil paint on canvas, The Faringdon Collection Trust. • Fictional pirates in popular culture are the subject of a new exhibition at the V&A Museum of Childhood in Bethnal Green. A Pirate’s Life For Me explores the origins and characters of fictional pirates through more than 80 objects including David Munrow’s unpublished play Barnacle Bill, toys designed by Playmobil (exhibition sponsor) and Lego, the first ever painting of Captain Pugwash (pictured), six 18th century Spanish doubloons and the original illustration of the costume design for Captain Hook for the first ever theatrical production of Peter Pan in 1904. Young visitors to the exhibition are invited to take a journey starting at a seaside tavern where they will find a mysterious map which leads on to a pirate boutique, large scale pirate ship and tropical “treasure island”. The exhibition runs until 22nd April. Admission is free. For more, see www.vam.ac.uk/moc/whats-on. 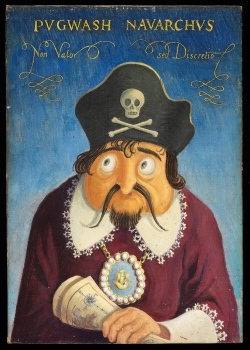 PICTURE: Framed painting of Captain Pugwash, painted by John Ryan, 1950, oil on board, © John Ryan Estate. • The British Museum’s new Albukhary Foundation Gallery of the Islamic World opened to the public last week with a display featuring a “comprehensive presentation of the Islamic world through art and material culture” including everything from architectural fragments of a Persian port city and courtly treasures of intricate craftsmanship to rich textiles from the Ottoman Empire and contemporary art. Among the objects on show, which cover the period from the 7th century to the present day, are the 14th century illustrated Persian epic, Shahnama (Book of Kings), and the 16th-century Indian Mughal emperor Akbar’s Hamzanama (Adventures of Hamza), elaborate 19th-century mother-of-pearl inlaid wooden Turkish bath clogs, a brightly decorated Uzbek woman’s robe with Russian lining and 21 stones, an installation of 21 paintings by Idris Khan created in response to the new gallery. A series of free public events is being held to mark the opening. Located in Rooms 42-43. The opening follows the reopening late last month of the Mitsubishi Corporation Japanese Galleries showing off some 430 artworks and artefacts from the museum’s Japanese collection. They included several newly acquired objects, such as a Edo period complete set of Samurai armour bearing the crest of the More clan and Time Waterfall – panel #8 (Blue), a contemporary digital artwork by Miyajima Tatsuo which will greet people as they enter. Found in Rooms 92-94. Admission is free. For more, see www.britishmuseum.org. 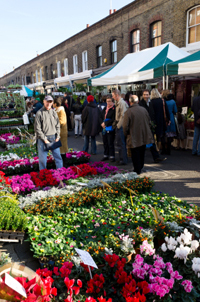 Originally founded in the early 1800s, the Columbia Road market in East London has since evolved into a specialist flower market on Sundays. First emerging as a general street market in the early 1800s, the market was formalised in the mid 1800s when banking heiress Angela Burdett-Coutts financed the construction of the now demolished – and somewhat architecturally fanciful – Columbia Market. This opened in 1869 at the northern end of the road but didn’t prove a great success. Despite efforts to save it – including apparently relaunching it as a fish market – it closed in 1885. The market building – which is said to have resembled the sort of market hall that might be found in rural areas – was later used as a warehouse but after suffering bomb damage in World War II were demolished. The market, meanwhile, reappeared on the street and as the area’s Jewish population grew, moved to a Sunday, a decision which allowed traders from Covent Garden and Spitalfields to trade their leftover goods from the previous day. The introduction of new regulations – including those introduced in the 1960s requiring traders to attend regularly – saw the market gradually transform itself into the colorful market selling cut flowers, plants and bulbs you can find there today. Popular with film makers and photographers thanks to the colourful backdrop it provides, the surrounding streets also feature a range of interesting independent shops and cafes. WHERE: Columbia Road, Bethnal Green (nearest Tube stations are Shoreditch, Liverpool Street, Aldgate East and Bethnal Green); WHEN: 8am to 2pm Sunday; COST: Free; WEBSITE(S): www.columbiaroad.info/www.columbia-flower-market.freewebspace.com/index.html.